Regency, Jane Austen Inspired, Chemisette in Muslin With Ruffle Collar. muslin chemise with machine embroidered hem Regency style Chemise that is worn under short stays. 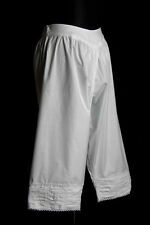 This version is made from a white 100% cotton Muslin and has a drawstring neckline. Will fit up to UK size 20 length 34" sleeve width 15” If you would like a Regency garment made to your specifications contact us through social media - Mrs Papendick, Historical Seamstress or our website. A handmade regency inspired chemise to be worn under stays/corset or as a nightdress. Regency style Chemisette that sits under a gown to give a different neckline option. 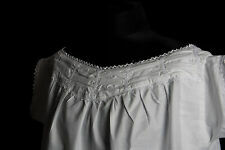 This version is made from a white 100% cotton Muslin and has a ruffle collar. The Chemisette fastens at the empire line with a drawstring, so is truly adjustable stretching up to a size 22( UK) max. Regency, Chemisette Embroidered Cotton Lawn With Ruffle Collar. Regency style Chemisette that sits under a gown to give a different neckline option. These were incredibly popular at the time. This version is made from a white self embroidered 100% cotton Lawn and has a ruffle collar. The Chemisette fastens at the empire line with a drawstring, as does the neck, so is truly adjustable stretching up to a size 22( UK) max. Neck 20" max Back length 13" If you would like a Regency garment made to your specifications contact us through social media - Mrs Papendick, Historical Seamstress or our website. Old, vintage hand-made Bustle, Royal Shakespeare Co. Cream cotton/linen. Royal Shakespeare Co. Cream cotton/linen. Quite tatty and marked, but it is very old, and it will have been used under many other layers, in many performances - causing wear. Though it is old it could easily be repaired. FANTASTIC BLACK COUTIL CORSET IN SELF PATTERNED QUALITY BELGIAN COUTIL.FULLY BONED THROUGHOUT WITH SPRING STEEL BONING. ( NOT INFERIOR BONING) IDEAL FOR ACQUIRING AN AUTHENTIC VICTORIAN SHAPE AS FOR SHAVING 2"- 5" OF YOUR WAIST TO ACHIEVE THAT HOUR GLASS LOOK. Thick cotton with fancy hems.